Probably one of the most controversial game franchises in history, the Grand Theft Auto series has always been associated with anti-social behaviour and was even banned in Australia only a few years ago. Not only did this game break all the social norms of society but it also took gaming to the next evolutionary stage of almost unlimited freedom with some of the most impressive looking graphics to grace the console world. Fortunately for owners of the GameBoy Advance (& Nintendo DS), the title finally arrives on the system and promises the same excitement and storyline from its big console brothers. The story revolves around two thugs who are contemplating going straight but unfortunately for you, your partner Vinnie wants to do a few more jobs to help get some extra cash before he goes on the straight and narrow. Unfortunately things go wrong and after a few missions, Vinnie is killed by a car bomb. This provokes you to go on a roaring rampage of revenge as you try to find the answers behind Vinnie's death and also make a quick buck or two along the way. 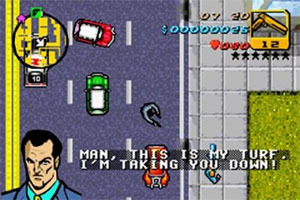 Although this current incarnation is extremely similar to the original PSOne and PC version with its top down view of the city and similar gameplay, it is, in actual fact more similar to the previous game on the PS2 and XBox, Grand Theft Auto Vice City. With that said, the player must embark on a variety of different missions but as this is a free roaming game, the gamer can also perform a myriad of different side quests or go on the occasional killing spree when things get a little tough. The missions themselves are good fun, if a little repetitive, such as having to drive to certain destinations, leap out of your car and collect items and gun people down or time trials such getting from one point to another (sometimes extremely frustrating). Besides the top down view, you also have a few other bits and odds in the corner of your screen, providing a variety of useful information. These include the amount of money you have, which weapon is equipped for when you jump out of your car, your infamy rating (the higher this is the more cops chase you) and your health. There's also the obligatory and absolutely essential map, which shows you where to find things and provides the layout of Liberty City. As you play the game, more locales are highlighted on your map, such as your hideout, weapon shops and the famous garages that are used for re-spraying your cars. Graphically, Grand Theft Auto Advance is something to behold. 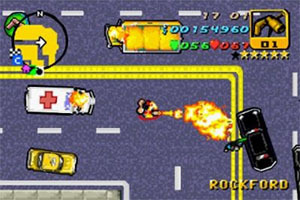 Its top view is purely GTA I and II but then again, when you’re passing through the familiar street corners of the Portland Red Light District, you’ll see the influence of the third game throughout. The three islands are connected to each other, making this one massive playground filled with alleys, parking lots, hospitals and even the Shoreside Vale airport. The vehicles are pretty basic but you get the idea which one are the slow cars and which ones are made for zipping through traffic. Speaking of traffic, the game does a marvellous job of showcasing dozens of moving vehicles and pedestrians but unfortunately causes some heavy duty frame rate issues. There’s also the traditional gore that spreads around a flattened (or shot) pedestrian or gang member and explodes right before your eyes when they’ve taken enough damage. The sound effects and music is rather impressive on the GameBoy Advance and to give Rockstar some credit, they did try and vary the different themes depending on which car you get into, which reflects the radio station the driver may have been listening to, but this novelty wears off fast when you realise how short the continuous loop of each is. There are voice samples which raise the bar a little but they're so few and far between as to be drowned out in the cacophony. 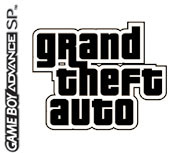 In conclusion, Grand Theft Auto Advance is one of the most impressive Game Boy Advance games to come along this year. Its style pays homage to the series by offering an action-packed jaunt into a living, breathing world filled to the brim with dozens of things to do whenever you feel like it. The missions are more than plentiful and the controls are as perfect as they come. Highly Recommended!